Melbourne four-piece, Mustered Courage, have positioned themselves in the forefront of Australia’s bluegrass genre. The Golden Guitar Award winning and ARIA nominatedband are set to release their fourth studio album, and first new album since 2015 titled “We Played With Fire” due for release on in September. 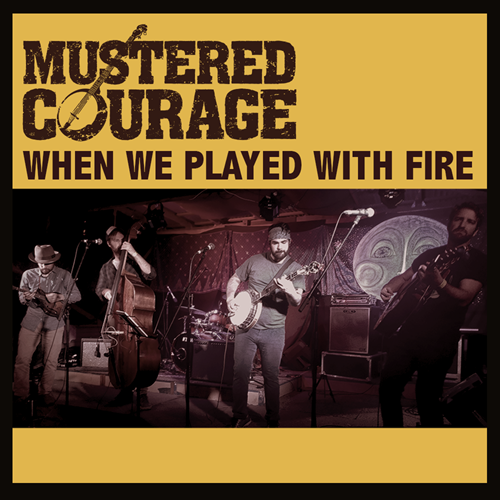 The single “When We Played With Fire” leads the album’s release and is available for download now. It’s the love and obsession thatNick Keeling (Banjo), Julian Abrahams (Guitar), Josh Bridges (Double Bass) and Josh Bennett (Mandolin)have for bluegrass that begun their journey in 2010. Since then, they’ve toured the USAfour times, played as Paul Kelly's band, collaborated with Kasey Chambers and have graced the stages ofcountless music festivals across the world. Known for pushing the boundaries of what progressive folk-rock can be, they convinced prolific rock and roll songwriter, performer and Choirboys founder/singer, Mark Gable to record and performChoirboys’ pub-rock anthem ‘Run To Paradise’ with a bluegrass twistwhich was released in May 2018 to much fanfare and accolade.